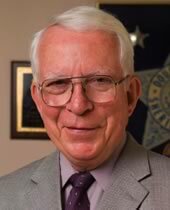 On March 24, 2004, at age 67, David Root restored integrity to–and faith in–the Abita Springs police department. Initially appointed to chair an investigation into allegations of pervasive corruption in the department, David’s success led to his appointment as interim police chief. Seven months later, he presented a revitalized department to the new chief and to the citizens of this historic town. It would have been difficult for the mayor and residents of Abita Springs to find someone more qualified or more ideally suited for this critical assignment. Having retired to the town after a brilliant career in forensic chemistry with the U.S. Food and Drug Administration, David Root brought a unique lifetime of experience to the task. David’s vast expertise in chemical analysis with the FDA led to his selection as an expert resource for the newly formed U.S. Drug Enforcement Administration in the 1960s. His DEA work soon expanded to undercover assignments, working in tandem with local law enforcement agencies. His law enforcement experience led to an intimate knowledge of local police force operations and procedures. All the while, David rose in the FDA ranks to the point of overseeing research of up to 200 scientists and consulting with the governments of Canada, Mexico and El Salvador. In essence, David Root offered the town of Abita Springs the perfect formula for excellence: experience combined with integrity and honor. It takes a lifetime to amass the expertise that enabled David Root to accomplish his task with such success. In his unflinching drive to help his community and fellow man, David Root is committed to making our world a better place. For proof, you need look no further than the town of Abita Springs. David Root… Peoples Health Champion.